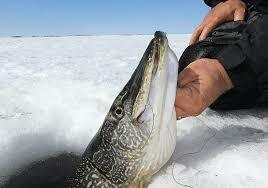 Ice fishermen enjoy catching pike. They are a bigger quarry, fight hard, and can be great eating if you know how to clean and cook them. Pike are a very boney fish. Fileting requires a different approach due to the abundant Y and Pin bones. You can’t just pull the filet off in one piece and expect a bone free meal. Search “How to filet a pike” for directions on good ways to prepare your pike meat. Typically, the meat ends up looking more like long fish sticks than filets. Now that you have boneless and skinless meat, here is a wonderful recipe that you can use to make the best pike appetizers you have ever eaten. Cut your pike meat into large chunks. Depending on the size of the fish, these chunks can be a couple inches in size. Now create a brine. 3 quarts of water, 2 tbsp of vinegar, ½ cup of sugar, 2 Bay Leaves, 1 stick of celery, 2 teaspoons of red pepper/ or Old Bay Seasoning, 2 tablespoons of salt, 3 teaspoons Black Pepper, one whole onion. Combine all the ingredients and bring to a boil. Now add the fish chunks and continue a soft boil for 10-15 minutes. Longer for big chunks than small. If the fish chunks begin to separate, they are done. Serve with melted butter or as you would serve lobster. 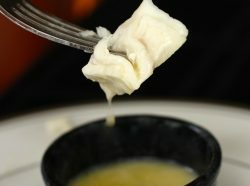 Other sauces, depending upon your tastes, are also a good idea. I also enjoy the flavor of Old Bay seafood seasoning and use this in the brine and butter dip. You will not need any leftover containers for this tasty meal. What you will need is to schedule another fishing date, so you can catch more pike! Open Wide for Pike Chunks!